This question gnaws at me every time I end up on a bad date. “Is online dating worth it?” I wonder as I prepare to get back on the carousel of swipes, likes, and messages. That’s a question every single person has to ask themselves at some point. Whenever I begin to doubt that online dating is worth the time, effort, and trouble, I think about the people I have met — the really good ones. The guy who made pizza while we watched a Harry Potter movie together. The guy who brought me flowers on our third date. The guy who always texted to make sure I got home safe at the end of the night. These genuinely good dates make it worth it for me because, even if our connection didn’t last, I’m glad I got to know them. If you’re single, your best bet at finding a date is to go where the singles are. That used to mean hanging out for hours at a bar. Now it means spending a few minutes a day swiping through an app. A lot of people are on dating sites and apps these days, and that makes it opportunity-rich places for modern daters. According to eHarmony, 40 million Americans have used online dating. 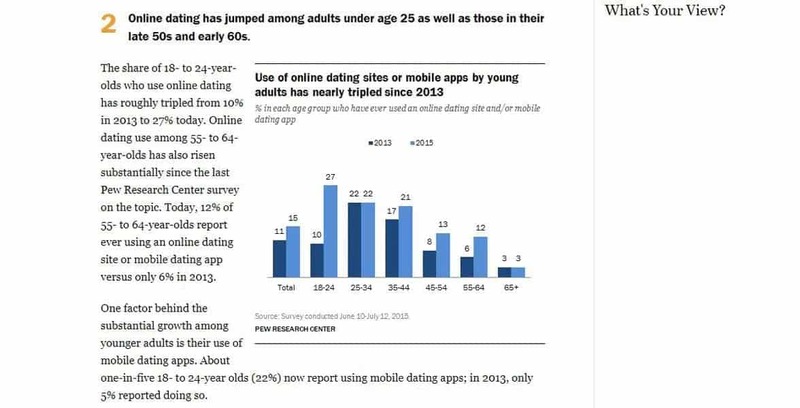 It’s particularly popular among young daters — 27% of singles between 18 and 24 reported using a dating site or app in 2015. According to the Pew Research Center, a growing number of American singles use online dating to meet new people. On a dating site, you have the chance to meet dozens of people in a single night — people you may never have met irl. And that’s very valuable. You can save yourself some time hunting for a date by heading to a popular dating app with thousands of options at your fingertips. When you walk into a bar or a party, you can’t control who’s going to be there. You don’t really know if the cutie sitting in the corner is single, let alone a good match for you. People in the real world come from a variety of backgrounds, and narrowing down a roomful of people to a compatible few is difficult when all you have to go on is what someone is wearing. On a dating site, however, people with similar relationship goals, backgrounds, and interests can come together. They can choose niche sites where they’ll find people they’re attracted to — and people who are attracted to them as well. Dating sites often feature search tools that make it easy to target specific traits or identifiers. You can even search by keyword sometimes. One of the biggest benefits to online dating is it allows singles to focus on certain desirable qualities when seeking a date. Do you only see yourself marrying a Christian? Then join a Christian dating site. Are you only attracted to redheads? Then sign up for a redhead dating site. Even on general dating sites, you can usually find someone who’s your type within a few clicks or swipes. At the very least, you know everyone there is actively looking for a date — and that’s more than you can say for the local bar scene. In the real world, you could waste hours chatting someone up only to find out they’re taken. Or a cat person. Or gay/straight. Or whatever your dealbreaker is. You can’t easily identify it when you’ve just met someone in the real world. But you can online. Going up to talk to a complete stranger in the middle of the grocery store or coffee shop is just plain terrifying. Even if you’re extroverted, it takes a lot of bravery and confidence to try to start a conversation and build a relationship out of thin air. I dare you to watch the guy in the video below practice bad pick-up lines in broad daylight without cringing. It’s rough out there! Fortunately, online dating offers a low-pressure environment to connect with someone. You can indicate your interest with a like or a wink and wait to see if you get a response before saying hello. Dating platforms also offer singles the chance to plan out and practice their conversation starters without feeling the pressure of someone staring at them as they trip over their words. Some people find it easier to seem smooth when they have a moment to compose themselves and think about their responses. On the whole, introducing yourself to someone on a dating site takes a lot less effort and isn’t as nerve-wracking as coming up to a crush in person. And you’re not risking very much because you can always ex out of the conversation or even block the user should things turn south. Online dating is still a relatively new phenomenon, but a growing body of data suggests the relationships that have formed between people who met online are generally stronger and longer lasting than those formed between people who met offline. In 2012, researchers compiled and assessed data from 19,000 marriages and concluded that marriages between people who met online were less likely to get a divorce. Plus, spouses who met online expressed a higher degree of satisfaction with their relationships than spouses who met through friends or more traditional means. This groundbreaking study makes a strong case in favor of online dating. Although correlation doesn’t prove causation, it’s nonetheless encouraging to know online daters experience high-caliber relationships. By joining a dating site, you may be setting yourself up for long-term happiness and marital bliss. And, hey, if you can avoid divorce court by meeting your partner on a dating site, I’d say that’s worth it. While a dating site can’t guarantee you’ll find someone, it’s better than doing nothing and waiting for a perfect match to come to your doorstep. You’re not going to find someone sitting at home on your couch — unless you happen to have a dating app in your hand. Taking a chance on yourself and trying something new is what online dating is all about. Online dating may not be the most effective system ever, but you’re never going to get anywhere by shying away from the action. It’s at least worth trying. What do you have to lose? Joining a free dating site won’t cost you anything, and you can get a feel for what online dating is like without investing much time or energy. When I think about all the good conversations I’ve had because I joined a dating site, I think, yeah, maybe it’s been worth it for me. But I can’t know for sure if it’ll be worth it for you. That’s something you have to decide for yourself. You’ve read our assessment of why we think online dating is worth giving a try — our five reasons sum up what online dating has to offer — so now you can make your own judgment. Is online dating worth it? That depends on what you want and what you’re willing to go through to get it. Because it’s probably not going to come easy. You may have to endure some bad dates, some creepy messages, and some ghosting jerks to get to a person worth seeking. You may not always feel excited about logging in and starting another conversation. But you never know what could happen if you take a chance and put yourself out there. It could be disastrous. Or it could be brilliant. Online dating is worth it — as long as you do your part and make the most out of it. A dating site is just a platform; it can’t do the work for you. You have to take advantage of the endless possibilities on a dating site to make your dream date a reality.